England followed up their victory against Czech Republic with another easy three points in Euro 2020 qualification. England quickly responded after conceding the opening goal, eventually cruising past Montenegro to present their first streak of five consecutive victories in 90 minutes under Gareth Southgate. All the pre-match discussion had surrounded one Chelsea fringe player but it was another who went under the radar that turned the contest. Marko Vesovic had opened the scoring completely against the run of play before a quick response from the head of Michael Keane and a prodded effort from the creative Ross Barkley gave England a confidence boost before the break. Fatos Beqiraj missed a great chance to draw level before Barkley manufactured his third goal involvement of the contest, slotting home a second strike. With the home side resigned to defeat, Raheem Sterling continued his impressive international form to create one and score another as England netted five for the second time in four days. Gareth Southgate opted to hand youngsters Callum Hudson-Odoi and Declan Rice full debuts, despite the former yet to appear from the start in a Premier League contest. Danny Rose also replaced Ben Chilwell at left-back, whilst Barkley came in for the injured Eric Dier. The hosts found themselves without captain and record goalscorer, Stefan Jovetic but were able to deploy Atletico Madrid star Stefan Savic to lead the line at the back in a team brimming with players dotted domestically around Europe. Incheon United's Stefan Mugosa was the goal threat with four strikes in his last quartet of internationals, the focal point of an organised 4-4-2 formation. England went into the contest as comfortable favourites following their 5-0 thrashing against Czech Republic on Friday but Montenegro has notoriously been a difficult place to visit, fresh with a hostile atmosphere in Eastern Europe. The visitors could only draw in 2011 and 2013, albeit in a much louder environment than what was presented to England on Monday evening. After a sustained spell of possession in the opening minutes, the first half chance fell to Harry Maguire but he could only direct his header from Barkley's corner distantly over the crossbar. Yet the hosts could barely get a foot on the ball as Friday's hero, Raheem Sterling, dominated proceedings on the left. On the opposite side of the pitch, Montenegro's Marko Vesovic had touched the ball just once in 16 minutes... yet it did not matter one iota considering what he did next. Michael Keane failed to clear his lines and was soft in the tackle when the ball dropped to the Legia Warsaw midfielder. Vesovic worked his way inside before curling an effort past Jordan Pickford to give his side a shock lead. England had been made to pay for a slow tempo despite the best part of 80% possession. It would have been easy for Montenegro to sit back and protect their lead but they started to show even more desire to break forward when they were on the ball. Vesovic was continuing to cause problems as the hosts started to click on the left, particularly with Hudson-Odoi struggling to get back and offer protection for Kyle Walker. Yet the visitors did manage to restore parity on the 30-minute mark. Barkley whipped over another dangerous set-piece, finding the head of Keane who timed his run to perfection, outclimbing Savic to nod the ball into the bottom corner. A first international goal for the defender. At the other end, Mugosa found space in between the lines, an area usually deployed by Dier or Jordan Henderson, and connected well with a half-volley but it was comfortably collected by Pickford. All of a sudden the game was starting to open up as Hudson-Odoi and Fatos Beqiraj took it in turns to terrorise the opposing defence but such a momentum shift was undoubtedly working in the favour of the more naturally gifted squad. Switching to the left, Hudson-Odoi was starting to showcase his attacking talent, despite being England's second youngest competition international debutant. The Chelsea winger cut inside before unleashing a right-foot effort that was prodded home by Barkley. Panic over. The second half appeared perfectly poised for England. Montenegro were faced with a dangling carrot of only one goal to draw level, whilst the visitors had the pace on the counter-attack to tear them apart. Moments after Mirko Ivanic blazed over, Hudson-Odoi picked out Sterling with a lofted cross but he struggled to make sufficient contact from a difficult angle. The former then brought down a Harry Kane pass with aplomb, floating inside before forcing Daniel Petkovic into a stretched stop. Yet Montenegro had a golden opportunity to equalise just ten minutes after the restart. Rose failed to clear his lines on two occasions before the ball was worked across to Beqiraj who could only turn his effort wide. A miss that symbolised his weak scoring record at international level. Just minutes after Montenegro should have been level, they found themselves two goals behind. Sterling made a bit of a mess of his opportunity to squeeze a pass across goal but a lazy attempted interception by Savic only deflected the ball to Barkley who slotted home his second of the game. With the result looking certain, the game filtered into a quiet spell for a short period. Jordan Henderson came on for his 50th cap before Barkley made another telling contribution, seemingly able to change the tempo at the flick of a switch. Picking the ball up on the halfway line, Barkley released Sterling behind the Montenegro back four who fed Kane for an easy finish into an open net. As the game dwindled into the last ten minutes, Henderson slid through a pass to set Sterling through on goal and add his fourth strike in just two matches. A tenth goal for England in less than three hours of football before cameos for James Ward-Prowse and Callum Wilson. Other than some ill-advised verbals from Henderson and Rose with a handful of home players in the final moments, the fireworks had long since burnt out as England ensured another comfortable success. Much of the pre-match talk was about Hudson-Odoi becoming the youngest England player to make a competitive international debut since Wayne Rooney. Yet it was Ross Barkley who rose from the shadows to dig England out of a hole. The midfielder was England's main source of creativity in the first third of the contest, creating chances from set-pieces with his cultured right foot. After setting up Keane's equaliser, the Chelsea man then added two of his own before starting the move for England's fourth, justifying his selection in place of the injured Eric Dier. Montenegro's opening goal perhaps caused more harm than good. They proved a tough unit to break down until the 17th minute strike, at which point they seemed to grow too much in confidence. Bursting forward when they got the ball, too many players were left exposed, opening spaces for the nippy and creative England midfielders to exploit opportunities. Should Keane be an England regular? He may have netted the equaliser but question marks over Michael Keane's defending were brought to the attention on the rare occasions that the home side were able to formulate pressure. 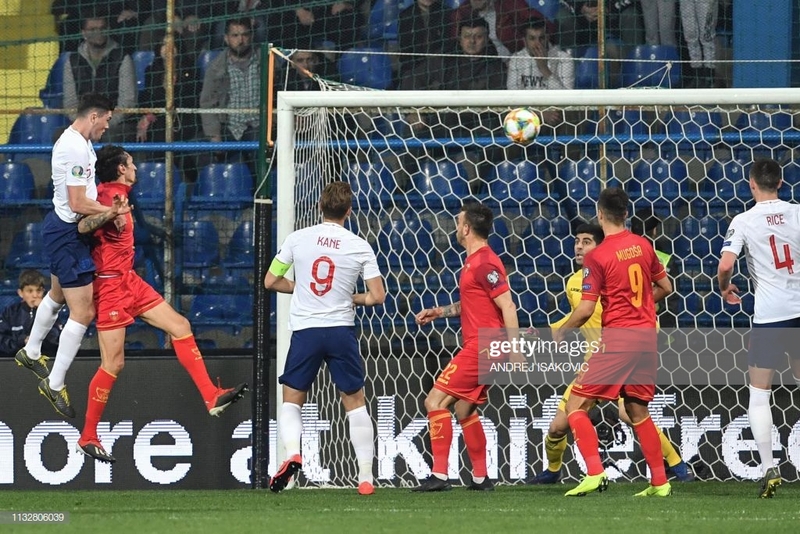 The centre-back had two opportunities to clear before Montenegro's goal, again exposing frailties that have been evident over the last two seasons with Everton. Perhaps with the exception of Harry Maguire, central defence still appears to be a weakness in this talented England squad. The likes of Barkley, Sterling and Hudson-Odoi were particularly impressive but Declan Rice quietly produced an impressive full international debut. Sitting at the base of midfield, Rice knitted everything together, completing 62 of 65 passes.